My younger daughter started eating solid food a few weeks ago, and she's getting pretty enthusiastic about it! Although I love breastfeeding, I always find it really exciting when my babies get to this stage. Maybe it's because I love food myself, so I'm excited to share it with them. Not to mention that being able to serve Baby a handful of Cheerios or a cracker is really convenient sometimes! If you have a baby near my daughter's age, I'm sure you've noticed that baby food can be really expensive. Depending on the brand and variety (organic vs conventional, etc. ), commercial baby food seems to run about $.50-$1.00 per serving. If your baby is eating three times a day, that adds up very quickly! However, paying regular prices for prepared food is not your only option; I've come up with a few ways to save significant money on baby's first foods. Take advantage of sales and coupons. If you've looked at all for deals on baby food, you may have noticed that there are not often coupons for it in the Sunday paper. However, that does not mean there are no coupons out there! Gerber, for instance, publishes coupons on their website; but you get the most coupons by signing up for their mailing list. They keep track of your baby's age and send you coupons every couple of months for age-appropriate products. Further, once you start using the Gerber Graduates products, you can send away for a coupon booklet once you've collected 10 upc cut-outs. I like to try to get organic baby food when possible, so I bought a lot of Earth's Best brand for my older daughter. This brand is reasonably priced, and you can find coupons for $1.00 off ten jars in many parenting magazines and other locations. Beech Nut baby food also has a mailing list and has special offers on their website. Dana at Frugal in Virginia gave me the idea of using baby food coupons at triple coupon events, such as Harris Teeter's. I've done this a few times now, stocking up before the baby was even eating solids, and I've gotten three packages of baby food for less than the regular price of one each time. Even if your store doesn't have triple coupon events, pairing your coupons with a sale can save a decent amount of money. Baby food does seem to go on modest sales fairly regularly. Make homemade baby food. I did this a lot with my older daughter as well. It's very easy to do; I use this baby food mill and freezer trays . I received these as a gift, but they are inexpensive and a very worthwhile investment. You don't have have to get complicated with homemade baby food. Mashing up some sweet potatoes or making a simple homemade applesauce were two of my favorites. I plan to share some more homemade baby food recipes and techniques later this week. Check back later this week for posts (and pictures) of some simple baby food recipes that I've tried! 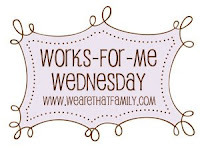 PS - Check out more Works for Me Wednesday at We Are That Family. I agree with you about moving a baby to table food sooner rather than later. Much to my surprise, my daughter really didn't like baby food at all and wanted to self-feed from about seven months. I was surprised at how much table food she was able to handle at that age. If she hadn't pushed for it, I would have probably continued to give her only baby food for months longer than I did. Now that our second baby is on the way, even if he doesn't exhibit that same independence so early, I will know that he is able to eat those foods. I've been making most of my daughters baby food for about 6 months. She is now eating a lot of table food, (she finally go some teeth!) and it's so nice. I think making baby food is so much more frugal than buying it. It is time consuming, but worth the effort, in my opinion. I like #3! Turtle ate baby food WAY too long -- till a year I think! #2 Daughter was eating table food primarily from the get-go. I don't think I bought much baby food at all. I cringe to think of how much money I spent on baby food 3xs a day for #1 for all that time!